Klein Sun Gallery is pleased to announce “Greater New York,” a solo show of multimedia works by Beijing-based artist Peili, on view from June 30 through August 19, 2016. To Peili, it matters less who the artist is than who the viewer is. A previous work, “Artist Should be Beautiful,” regurgitates the iconic 1975 Marina Abramovic video piece “Art Must be Beautiful, Artist Must be Beautiful”. Here, Peili undergoes jaw reconstruction surgery to realize the oddly appealing ideals of artistic and aesthetic beauty mired in suffering and pain. Another performance piece, “Ms Lonely,” sees the artist poetically recreating Vincent Van Gogh’s painting “Irises” in arcs of graffiti across flat boards similar to theater backdrops. The performance is insular and isolated, visible only to those who care or dare to enter the four walls where Peili is painting. Those who are busy, or indifferently walking past, miss the performance altogether. For her first solo show in the United States, Peili presents sound installations, video pieces and oil paintings on aluminum. Her sound installations, collectively titled “Long and Short Pavilion,” are muted works. Peili recorded acquaintances’ stories on tape, and then placed these recordings within vacuum metal balls filled with silky-black Chinese ink. When the tape plays, the muffled voices reverberate through the layers of metal and ink. Meanwhile, her paintings hint at the title of the show, which is taken from the mammoth MoMA PS1 series. Although Peili has expressly stated her dislike of that series, she admits that the title embodies her wider interest in free will. 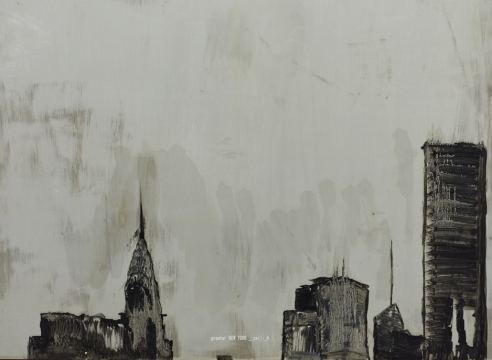 Thus, the paintings render portions of the city’s skylines and landmarks in simple, monochromatic strokes, imbued with Peili’s romanticized views of New York. Two videos are also shown. “The Moles,” screened during the day, reveals Peili’s lapses into depression; she describes her companionship with her therapy dog, Max, who visually narrates the video through a camera attached to his back. The second video takes the form of a televised advertisement, enticing viewers to come visit the show. Peili is seen wearing a dog mask – partially due to shyness and partially due to the absurdity of celebrity artists – as she advertises the prices of the artworks on view. Mysteriously, the video only loops at night, lighting up a deserted West 22nd Street. The work overlaps with Peili’s own internal wish – to walk alone at night, and to be welcomed by a bright light from an art gallery: a source of solace on a quiet and empty street. Peili has exhibited in group shows at global museums and institutions worldwide, including “The 2nd ‘CAFAM Future’ Exhibition,” Beijing, China (2015); “Future Returns: Contemporary Art from China,” Eli and Edythe Broad Museum Art Museum, Michigan, MI (2014); “Remix,” Bury Art Museum, Manchester, England (2014); “All That is Solid Melts Into Air,” Kabuso Art Museum, Øystese, Norway (2013); “Taikang Gallery 15 Years Collection,” National Art Museum of China, Beijing, China (2011); “Fat Art – Hive,” Today Art Museum, Beijing, China (2011), and “Eye of the Dream: Video Art from China exhibition,” Customs House, Sydney, Australia (2011). For press inquiries, please contact Ysabelle Cheung at the gallery (212.255.4388) or via email at ysabelle@kleinsungallery.com. For all other inquiries, please contact Casey Burry at the gallery (212.255.4388) or via email at casey@kleinsungallery.com. 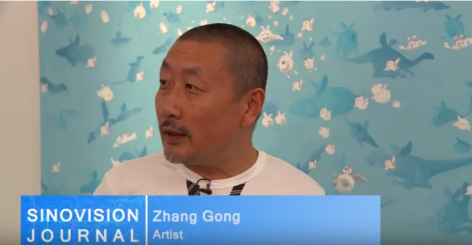 Sinovision English Channel publishes a short video featuring the exhibitions of Peili and Zhang Gong, with artist interviews.